As our Everest team are about to embark on the journey to Tibet, here’s a detailed outline of what’s in store for them over the next couple of months – and we’ll be sure to update you on their progress! 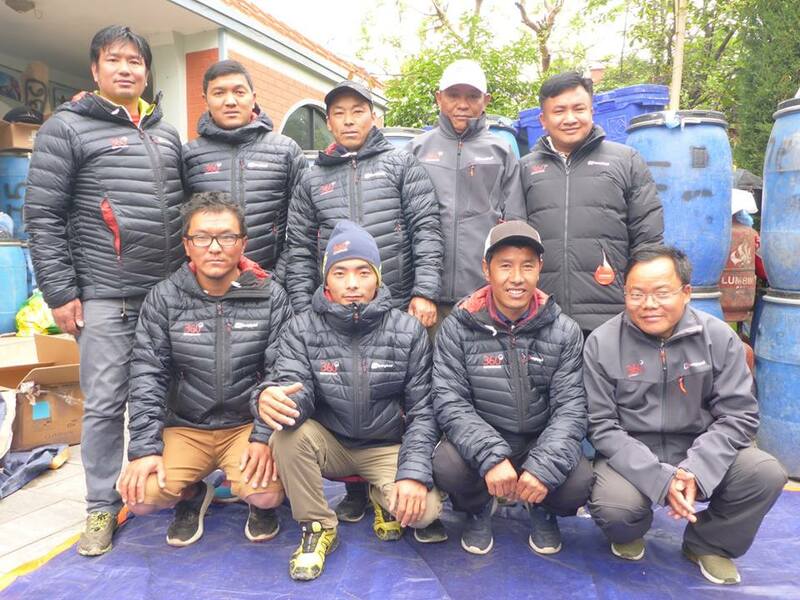 Our amazing Sherpa Team who enable this expedition to happen and our very excited team of Western climbers, all packed up and eager for the adventure to commence! Photo courtesy of Alan Arnette. You can follow his 2019 Everest season coverage here. The team will set off for the Tibetan border in 4×4 vehicles, via the Langtang region. The drive takes a full day and depending on border checks and security they might need to stay a night in a Nepali village before the border. If things run smoothly, they’ll cross and spend a night in a town an hour’s drive into Tibet at 2,800m. The next day is another long driving day. The team drive to Tingri at 4,200m crossing over a 5,000m pass. There are no villages between the border town and Tingri so this day involves a lot of altitude gain. They’ll stay in Tingri for a few nights, resting up and going for short walks to 4,800m to properly acclimatise. From Tingri, it’s a 6 hour drive to the basecamp (BC) of Mount Everest, at 5,100m. Base Camp is a state-of-the-art expedition camp and the team will have many of the luxuries of home provided, including 4G! The team will remain at basecamp for a short week to fully acclimatise to this critical altitude. Base Camp is the same height as Mount Kenya and just a bit higher than Mont Blanc. Time at basecamp is spent getting to know the Sherpa team and exploring this fascinating area. Climbers will also be briefed on topics related to high altitude climbing to build knowledge before ascending higher. At 6400m, ABC is the same altitude as Mera peak, higher than Denali and the same height as Camp 2 on Mount Everest South. Initially, they’ll take two days to trek/climb the 18km to ABC (walking about 6 hours on each day). Later on in the expedition, they’ll reduce this to a long single day. On the first rotation, a temporary intermediate camp will be placed at 5,700m on the edge of the East Rongbuk Glacier. All their camping equipment and the majority of personal luggage is brought up by yak. Climbers will only need to carry the personal items necessary for a day-walk at high altitude for the climb to ABC. They will be here for a handful of days and nights – anything from 3–6 days. Time at ABC is spent acclimatising to this altitude, learning how to use radios, avalanche transceivers and oxygen equipment and brushing up on various rope techniques. And of course, some socialising! ABC, like Base Camp, is a social hub and everyone there is involved in climbing the mountain. There are many different nationalities and often great friendships are made! 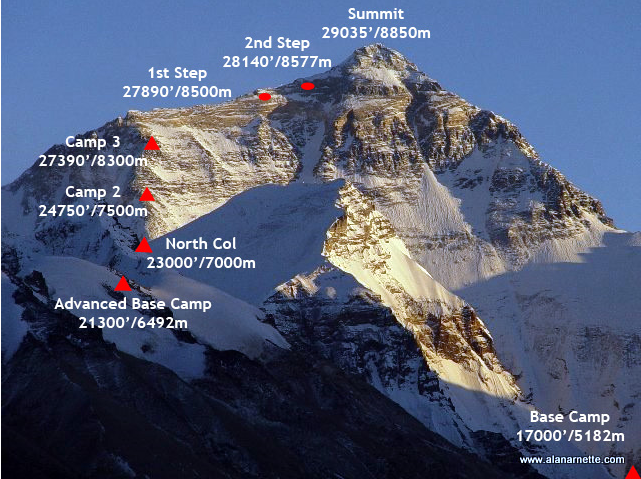 The team will also plan to climb to the North Col (camp one) at 7,050m and all going well, will spend a night there. After sufficient time at ABC, the team will descend back down to BC to recover. Being at 6,400m for too long in this early stages of the expedition can wear the climbers down and the benefits of recovery in the much lower Base Camp are many. The recovery phase back at Base Camp is dependent on how the team feel and can be from a few days to a week. The first rotation will feel hard – altitude will be doing what it does best and inevitably kicking their butts but it will seem far easier and quicker once properly acclimatised. The team plan to have 2 – 3 rotations to ABC. This period is also for around a week and by now the team will be feeling far better acclimatised and feeling generally stronger compared with the first visit here. They will re-ascend the fixed ropes to the North Col (Camp 1) and stay here for another night. The chance might present itself to touch Camp 2 (7,400m) whilst they’re based at Camp 1 but the main acclimatisation will happen by sleeping at this altitude. By this stage, the team will begin to develop a clearer individual ascent strategy and devise a plan which will maximise everyone’s chances to stand on the summit. The overall timing for the team as a whole will be discussed and determined as a team when at ABC for this second time. They will then drop back to Base Camp and start putting the summit plans into action – with potentially having a third rotation first. They’ll be flexible and adaptable – the key is to be ready and for some, acclimatising a bit more gives the best chance possible. The option for pre-summit recovery is available to the team and the plan will be decided in situ. Pre-summit recovery: In the past 2 years some teams and climbers have descended to Xegar (New Tingri, 4,200m) for a solid recovery period that can be anything from 2 – 3 nights. This option is best taken after the last planned rotation. It is only an option and has become available due to having detailed weather forecasts that we can trust, pinning when we think the best summit push will be. In the past, the risk in leaving Base Camp was too great as the climbers needed to be ready to go at a drop of a hat. New Tingri offers oxygen rich air, comfy beds, hot showers, beer and burgers – a tantalising rest bite for many. This period will be closely discussed and prepared for by the entire team. Everyone will be involved in the planning process, weather forecasting and the final build up to this most exciting part of the expedition. Obviously, many factors, both personal and mountain conditions, need to be considered before an individual climber is completely ready to go. Every climber within our 360 team has their own way of going about reaching the top, each will have trained in their own style and will have adapted to the altitude on their own terms. Each will have different prior experience, and each will have adapted differently in situ to the expedition as a whole. A flexible and hugely individualized strategy catering uniquely for each of our climbers’ parameters is what we are all about and each climber will be on their own ascent plan overseen by our head guide Rolfe Oostra. Ideally, they’ll ascend the mountain as one team but we have to consider the high possibility that they might be summiting at various times over a course of a few weeks. Each climber will have their own personal summit Sherpa. This allows greater flexibility and by the time the summit phase comes around they will be feeling comfortable with their allocated Sherpa who they would have come to know and trust since the early stages of the expedition. The usual summit bid is over 3-4 nights at Camp 1, Camp 2 and Camp 3. Whilst things can change quickly on the mountain and ascent strategies are subject to many variables, this comes close to how the expedition will develop – and we’ll be sure to update you as it progresses. Let the adventure commence!! Wishing a safe and successful summit to the whole team!